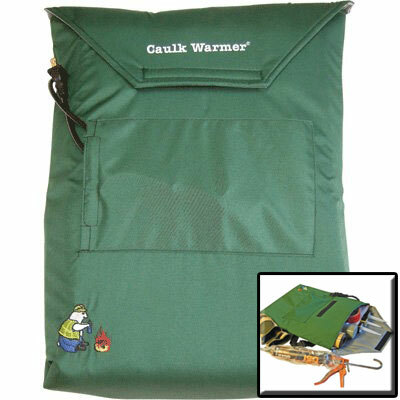 The Caulk Warmer� will save you time and money by keeping caulk warm in cold weather. Has a heavy-duty nylon canvas bag with a flexible heat shield, enclosed heating element and back strap. Plugs into 120V AC or 12V DC inverter (not included); has a convenient front cord storage pouch and on/off switch. Requires only 50 watts of power and will keep caulk at 80�F even when the outside temp drops to �13�F. Holds 12 standard size caulk tubes, 7 quart size tubes, 12 sausage size tubes, 7 cans of foam or a case of floor tiles. Warms: caulk, floor tiles, adhesives, insulating foam, windows and door sealing tape, grease cartridges, welding rods, gloves, even your lunch. Dimensions: 18" x 15" x 3"